There’s nothing better on a cold evening or while entertaining guests than serving a warm cup of soup. But who has the time and will it be healthy? Most soups take too long to make and tend to have tons of cream or butter it seems. 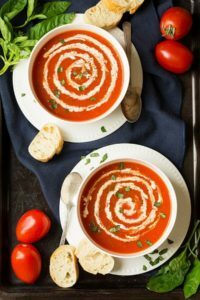 These soups may look like you spent hours making them but with 5 ingredients or less, they are actually quite doable even with our busy schedules! Healthy, tasty, quick and easy!